The Chesil Multi-Media Project also operates a number of stand-alone dataloggers measuring either water temperature only or water temperature and water depth. These loggers are deployed near the Black Hut at Ferrybridge and at Clouds Hill in the Upper Fleet. The aim is to understand the dynamics of the Fleet water movements and the variation of water temperature along the length of the Fleet. Initially the project used 8 bit loggers but it was found that these were not precise enough to give the fine detail of temperature and depth changes to be found in the Fleet. Two 12 bit recorders were donated to the project and these were a significant improvement but because they were intended for deep water use (200 metres FSD) they too were barely adequate for use in the Fleet. 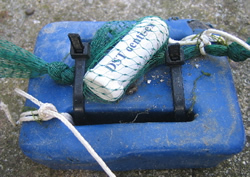 In 2006 two 16 bit loggers were acquired with part-funding by English Nature (now Natural England) and these are much more accurate and have significantly higher resolution on both temperature and depth. One unit is currently deployed at Clouds Hill in the West Fleet and the other close to the Black Hut in the Lower Fleet opposite Ferrybridge. It is hoped to purchase a third unit and deploy it in the Mid-Fleet in the near future. An example of a datalogger output is shown below. This was collected from a 12 bit logger for the 9 week period from 4th March to the 5th May 2007 at a location close to the Black Hut in the lower Fleet. The increase in water temperature through this period can be clearly seen. Note the daily cycle of increased temperature during the afternoon when the weather is sunny, particularly towards the end of the period. The lower graph illustrates the variation in depth range as the tidal cycle moves from neap tides (low depth range) to spring tides (increased depth range) and back to neap tides again on a two week cycle. The tidal range at peak springs is around 2.4 metres.